"HASUT" - "PATENT". 3.247" high x 2.398" wide. Brass case. Brass shackle. 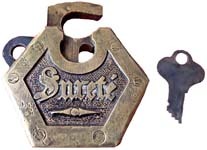 Twist push key. "JHW NEWARK N.J. U.S.A.". 1 1/2" high x 1" wide. Brass case. Brass shackle. 3 levers. 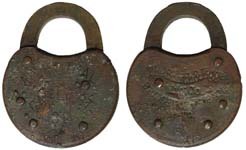 "JHW NEWARK N.J. U.S.A." is stamped on the obverse of the shackle. Mfg by: John H. Wilkins. "JHW NEWARK N.J. U.S.A.". 2 9/16" high x 1 15/16" wide. Brass case. Brass shackle. 5 levers. 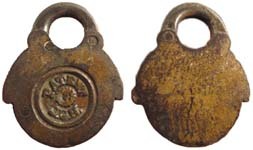 "JHW NEWARK N.J. U.S.A." is stamped on the obverse of the shackle. Mfg by: John H. Wilkins. 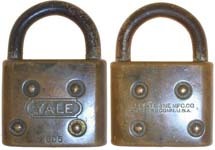 "KAYE'S PATENT 93 High Holborn London" - Steel Shackle. 3 1/2" high x 3 5/16" wide. Brass case. 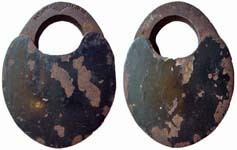 Steel shackle. The reverse of the lock is blank. 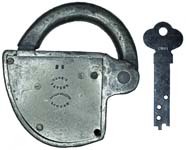 This lock has 3 active wards similar in principal to that of the SB Co. 3 Arm Lever Push Key Locks. Mfg by: British manufacture. "H. & J. W. KING". 2 3/8" wide. Steel case. Steel shackle. 5 lever. 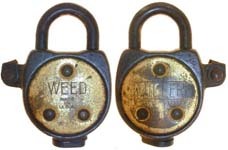 "H. & J. W. KING" is stamped on the obverse of the shackle. Made for: H. & J. W. King Hardware Co.
"KIRK GIBSON& BALTo PATENT 25". 3.059" high x 2.330. Brass case. Brass shackle. 5 levers. The reverse of the lock is blank. Mfg by: Gibson & Kirk. Patent Not Found. "LEICHER" - Design 1. 1.865" high x 1.645" wide x .435" deep. Brass case. Steel shackle. 4 Levers. 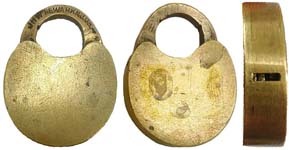 "GABI" is stamped on the obverse of the shackle. 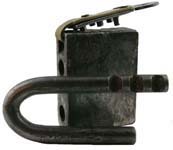 We have noticed that the shackle toe's are not consistent for this lock. Mfg by: Franz Leicher, Munchen Germany. "LEICHER II" - Design 2. 1.868" high x 1.627" wide x .425" deep. 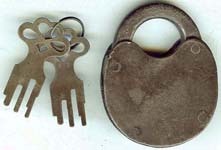 Original keys length: 2.062". Brass case. Steel shackle. 4 Levers. 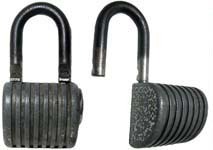 We have noticed that the shackles are not consistent for this lock. Mfg by: Franz Leicher, Munchen Germany. "J. LOCH PAT. JUNE 8 '80". 2.992" high x 1.999" wide. Brass case. Brass shackle. Joseph Loch # 228656. "MILLER". Steel case. Steel shackle. 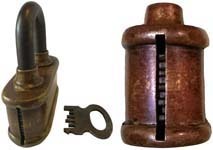 Mfg by: Miller Lock Co. Frank Soley Patent # 1384682. "M.L.H.&P.Co.". 3 1/4" high x 2 1/2" wide. Stamped steel case. Steel shackle. 5 Lever. 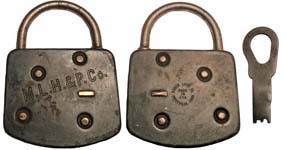 Made for: Montreal, Light, Heat & Power Co. Mfg by: Eagle Lock Co.
"PATENT 85". 3.660" high x 3.340" wide x 1.250" deep. Brass case. Steel shackle. "PATENT 85" is stamped on the top of the case. 4 levers. 5 wards. 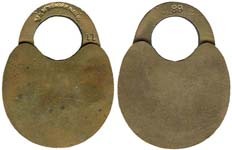 Scandinavian style shackle. 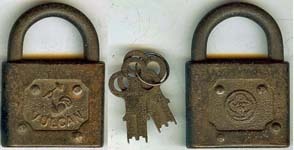 This lock was found in Budapest, Hungary. Anton Nerhaft US Patent # 957705. We have not been able to find any foreign patents. 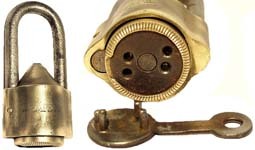 We believe this lock was not manufactured in the US. "PUBLIC SERVICE CO. OF NORTHERN, ILL.". 2" wide. Steel case. Steel shackle. Mfg by: Yale & Towne Mfg. Co. US Patent #586676. "R". 5/8" wide. Brass case. Brass shackle. 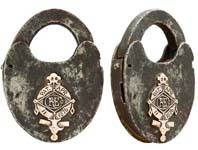 Mfg by: Reese Padlock Co.
"R&E Co PAT. APR. 11 1876.". 3 3/8" high x 2 1/2" wide x 1/2" deep. Steel case. Steel shackle. 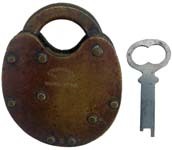 Side keyway. 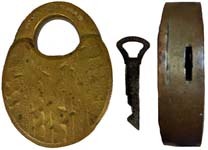 Pin tumbler push key principle. Mfg by: Russell & Erwin Mfg. Co. US Patent #175818. "ROCK FIELD" - "PAT. 415695 PATD. 90429". 3.1" high x 2.4" wide x .6" deep. Brass case. Brass shackle. Patent Not Found. 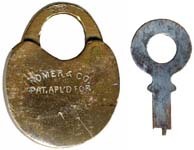 "ROMER & CO. PAT. APL'D FOR" - "83". 1 5/16" high x 1" wide x 1/4" deep. Brass case. Brass shackle. Mfg by: Romer & Co.
"S" - "PAT.NOV.22-92" - "PAT.APR.25-93". 3.176" high x 2.245" wide. Brass case. 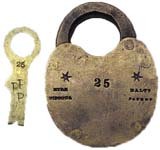 Brass shackle. 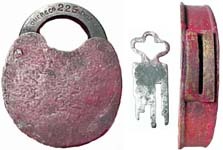 Twist push key. 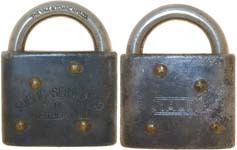 Mfg by: Schultze Lock Mfg. Co. US Patent #486685 US Patent #492240 US Patent #496369. 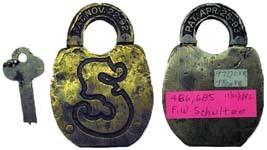 "S" - "PAT.NOV.22-92" - "PAT.APR.25-93". 3.176" high x 2.245" wide. Brass case. Brass shackle. 6 Levers. Flat push key. Mfg by: Schultze Lock Mfg. Co. US Patent #486685 US Patent #492240 US Patent #496369. "SERIL II". Steel case. Steel shackle. 3 3/4" high x 2 1/4" wide. "The Smith & Egge Mfg. Co. BRIDGEPORT CONN. PAT'D". 2 15/16" high x 2 5/16" wide x 7/16" deep. Brass case. Brass shackle. Mfg by: Smith & Egge Mfg. Co. US Patent #207407. 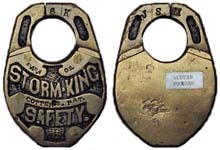 "STORM·KING SAFETY MAR.4 02. COTTER'S PAT.". 3.101" high x 2.148" wide. Brass case. Brass shackle. Flat push key. 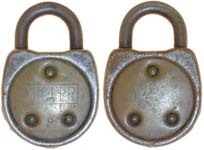 Mfg by: Schultze Lock Mfg. Co. Joseph J. Cotter Patent # 694837. "SURETE". 2 1/2" high x 2 1/2" wide x 9/16" deep. Brass case. Brass shackle. Surete translates to Surety/Safety. 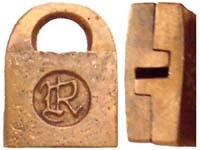 The reverse of the lock is blank. Mfg by: French manufacturer. "VERDUN". 3 11/16" high x 2 5/16" wide x 3/4" deep. Steel case. 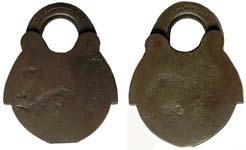 Steel shackle. Traces of nickel plating remain. Mfg by: Burg, Germany. "WEED". 2 1/8" wide. Steel case. Steel shackle. 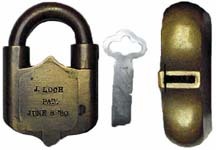 Mfg by: Miller Lock Co. US Patent #1384682. 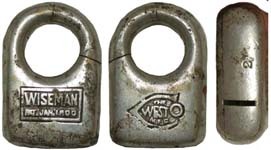 "WEST MFG CO". 1 3/4" wide. Brass case. 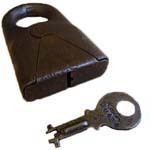 Brass shackle. Mfg by: West Mfg. 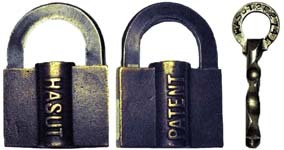 Co. Philip S. Wiseman Patent #'s 647592 1081710. 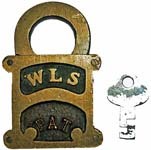 Wise Lock Co". 1 1/2" wide. Alloy case. 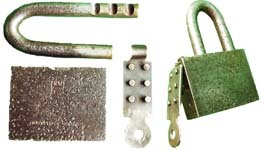 Alloy shackle. Mfg by: Wise Lock Co. US Patent #D86552. 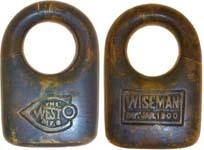 Wise Lock Co. 1 5/8" wide. Alloy case. 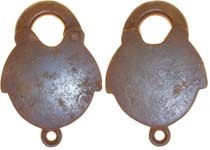 Alloy shackle. Mfg by: Wise Lock Co.
"WW Mfg Co". 3 1/16" high. Iron case. Iron shackle. Mfg by: William Wilcox Mfg. Co.
"YALE 605". 2 3/4" high x 2" wide. Brass case. 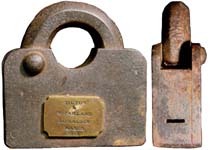 Steel shackle. This lock has 6 levers. Mfg by: Yale & Towne Mfg. Co.
"YALE 635". 3" high. Brass case. Steel shackle. This lock has 6 levers. Mfg by: Yale & Towne Mfg. Co.
"YALE". 2" wide. Steel case. Steel shackle. Mfg by: Yale & Towne Mfg. Co. US Patent #586676. "Y&T". 2 3/4" high x 2" wide x 1/2" deep. Steel case. 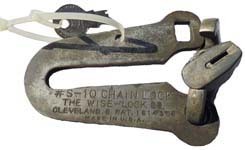 Steel shackle. Mfg by: Yale & Towne Mfg. Co. US Patent #586676.